The Emerald Day Break Lotus is a species in the family Nelumbonaceae. It is aquatic and has a number of names depending on the geographical locality. Its scientific name is Nelumbo nucifera. It is perennial and when exposed to favorable atmospheric conditions, its seeds last for such a long time. The oldest viability span of the seeds ever recorded is 1,300 years. It was spotted in northeastern China on a dry lakebed. This lotus species is usually cultivated in water gardens and it is native to Queensland, Australia and Tropical Asia. 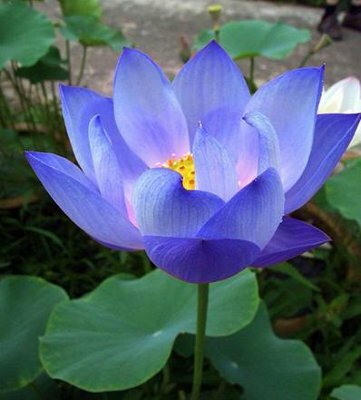 In Vietnam and India, the emerald day break lotus is a national flower. The emerald day break lotus usually grows to a height of around 150 cm and a width of up to 3 meters. In the pond where it grows, the lotus plants its roots into the bottom. The leaves can be seen floating on the water surface. Its flowers can be spotted on its thick stems that rise above the leaves. The leaves grow to about 60 cm in diameter while the flowers can attain a maturity level of 20 cm in diameter. According to research, an individual lotus has the capacity to live over 1,000 years. This compared to other plant species appears the longest. The seeds when dried assume the shape of watering cans sprouts. They are widely used for decorative purposes especially in flower arrangements. The young leaves, flowers, seeds and roots are edible and as such used as food in many parts of the world especially Asia. The petals can be used as garnish while the leaves are often used to wrap food. The roots are at times used in traditional Asian medicine. Nutritionally, the emerald day break lotus roots have been found to contain Vitamin C, dietary fiber, thymine, Vitamin B6, Potassium, riboflavin, Manganese and Copper. This richness in minerals has made this species of lotus valuable.